I’d like to extend a warm, southern welcome to our city. Whether you’re here for a quick stop on your travels, or to stay for a while, we hope Semmes feels like home. 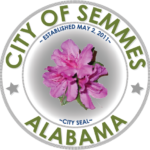 Great schools, miles of new sidewalk, parks with playgrounds, splash pad, good roads, safe neighborhoods; these are a few of the attractive benefits of the City of Semmes, Alabama. Semmes is pro-business with dozens of dining venues and shopping opportunities. We retain a small town feeling with events such as a Fourth of July patriotic extravaganza that features bands, bar-b-que,& a tremendous fireworks display for thousands of people. We host a Christmas tree lighting ceremony, a Christmas parade, & many other exciting events. Our Chamber of Commerce sponsors & conducts our Spring Azalea Festival complete with a popular 5K run, talent show and numerous food & craft vendors. We’re close to Mobile, Alabama with its museums, hospitals, professional ballpark and other attractions. Our emerging medical first responders, our well trained fire firefighters and dedicated county sheriff’s deputies help keep us safe & secure. We’ve built a close relationship with our public schools and provide a dynamic community recreation program drawing hundreds of participants. The Semmes Senior Center provides a warm welcome and new facilities for all of our seniors. The Semmes Library is one of the busiest & newest branches of the Mobile County Public Library System with dozens of programs all year long. Our citizens enjoy the lowest sales tax of any city in Mobile County. We have no property tax which serves to encourage an increase in business development & population growth. Regardless of your reason to visit, live, or grow a business, always know you are welcome in our town. You are welcome in the City of Semmes, the place we call home.